See Cello, The Happy GLAMper HERE! See Hooch, The Happy Camper HERE! See Lager, The Camping Canine Commander in Chief HERE! See Rita, The RV Rover camping adventures HERE! See Whiskey The Weekend Warrior HERE! Talk to your veterinarian and make sure your dog is healthy and up-to-date on all required vaccinations, particularly rabies. Ask your vet whether your dog should be vaccinated against Lyme disease, a tick-borne disease. Discuss appropriate flea and tick control. Be sure your dog is protected against heartworms, which are transmitted by mosquito bite and have been reported in all 50 states, according to the American Heartworm Society. Check to see whether the camping area allows dogs, and familiarize yourself with the rules for pets at the site. Bring water for your dog to drink if a water supply is not available at the campsite. Do not allow your dog to drink out of standing bodies of water. Your dog should continue to eat his regular diet during the trip; pack enough food and treats to last for your entire stay. Pack a food dish and water bowl. Bring bedding and toys to keep your dog occupied as well. Take a copy of your dog’s health records and vaccination reports, especially important if you are crossing state lines. Other essential items include a leash and collar or harness, a carrier or other means to confine your dog when necessary, bags to pick up your dog’s waste, a first aid kit and any medications your dog takes regularly. 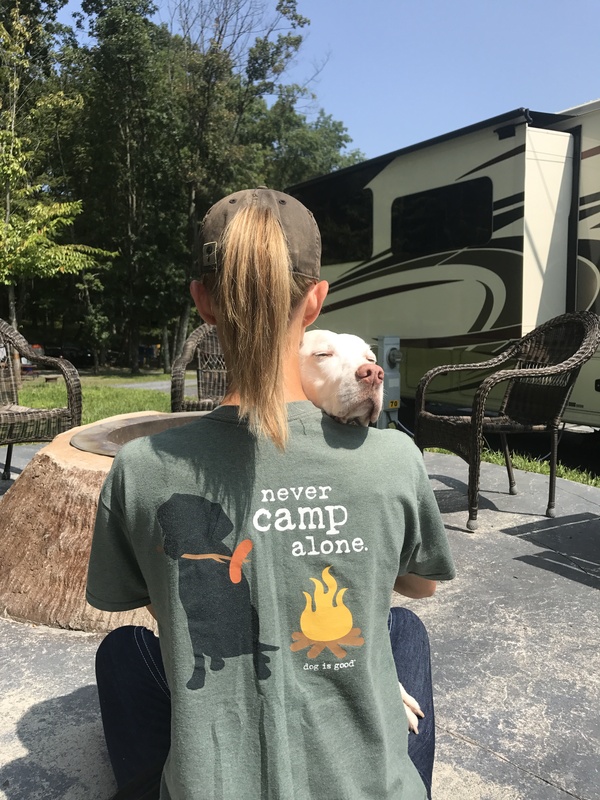 Once at the camping ground, keep your dog on a leash or otherwise confined so that other campers are not disturbed and your dog is not at risk for becoming lost or injured. Be aware of keeping your dog away from things such as campfires and cooking utensils that can cause injury. A “leave it” command is also useful in case your dog begins to explore or picks up something dangerous in his mouth. Keep your dog close to you during your camping expedition. If you are unable to supervise your dog, be sure he is properly confined. Do not leave your dog confined in a closed car or tied to a stationary object though. Provide a carrier, crate, or portable fencing unit instead. While camping, check your dog’s fur and skin regularly for ticks as well as for plant material like thorns or burrs. Plant materials should be brushed free of your dog’s hair, if possible. In some situations, cutting or shaving the hair may be necessary to remove these items. Remove Ticks promptly by grasping the tick near the skin and pulling gently and slowly away from the skin. Wear gloves when doing so. Do not handle ticks with bare hands as they can transmit diseases to you as well as to your dog. Before you go camping with a dog, it’s important to know where the closest 24 hour vet is. Though you never expect a medical emergency, a rattlesnake bite, for example, needs immediate attention. Simply having this information on hand will bring you peace of mind during the trip. The chance of a tick landing on your dog is relatively high. Be sure to buy tick medication before taking a dog camping to protect against the pests you can’t control. Remember, some flea medications do not cover ticks so make sure Fido has coverage; you can check with your vet about this before heading out. It’s also important you know how to get a tick off in case one does land. Ask your vet to show you how to remove it, or buy tick removal gear. Don’t forget to bring an extra leash, collar, dog meds, food and treats. If your dog has short hair, consider a thermal jacket or something to keep him warm. Also, bring a bed, towel or pillow for your pet to sleep on. Before you take a dog camping, consider how it will affect your hiking plans. Remember, many state parks forbid dogs on the trails. Don’t let your weekend be ruled by “No Dogs Allowed” signs, and be sure to check all of the rules before you depart. Though your dog is active on a regular basis, he may not be prepared for a 6-mile hike, or longer. Don’t risk taking him on a trip he can’t handle. Instead, take a few practice hikes beforehand. Try to find treks that is similar in terrain and required effort. 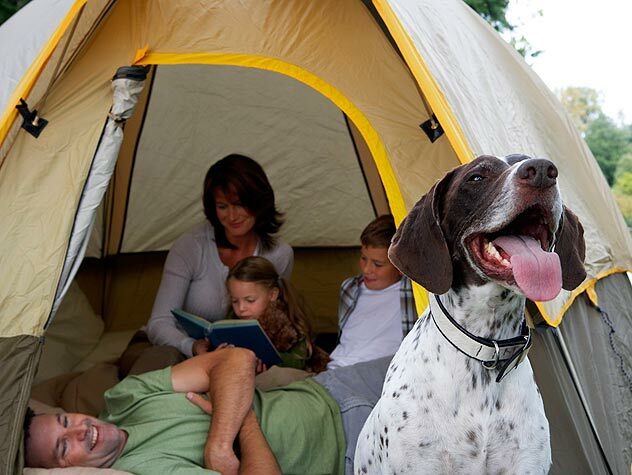 Camping with a dog is a no-brainer for families with pets. But, be sure to research the area and ask other dog owners for their suggestions to ensure your family and your pup have the best experience. BringFido.com has been providing pet friendly suggestions since April, 2005. BringFido.com is a dog travel directory that provides reviews, pet policy information, and online reservations at pet friendly hotels through a partnership with Travelocity. Information is also provided on bed & breakfasts, vacation rentals, and campgrounds that welcome pets in 150 countries worldwide. BringFido.com also provides information on both airlines and hotel pet policies, as well as recommendations on dog beaches, off-leash parks, outdoor restaurants, and other animal attractions in more than 10,000 cities around the world. Bring Fido has a toll-free number (877-411-FIDO) dog owners can call if they need assistance locating a a pet friendly hotel at the next exit on the highway, an animal hospital that’s open at 4am, or the best restaurant in the area that allows dogs to sit at its outdoor tables. 1. Bring Fido has confirmed the pet policy at every hotel listed on the website, so there won’t be any surprise pet fees, weight limits, or other restrictions when you check-in at the hotel. If you find a pet policy that is no longer accurate, you can contact them, and they will cover any additional pet fee you may have been charged. 2. Bring Fido does not charge a booking fee when you make a reservation. They guarantee that you’re getting the best rate available on all prepaid reservations. If you find a lower rate within 24 hours of booking, they will gladly refund the difference plus an additional $20. 3. You can choose a free gift every time you make a reservation online. Just visit the “freebies” page prior to booking to see the current offers and enter the appropriate gift code when making your reservation. They will ship your free t-shirt, sticker, or other gift as soon as you return home from the trip. 4. Bring Fido donates a portion of all proceeds to numerous pet charities, humane societies, and rescue groups every year. You can help save a homeless pet every time you reserve a hotel room through BringFido.com. DogFriendly.com has been helping humans share adventures with their canine kids since 1998. They have published world-wide pet travel guides for people with dogs of all sizes & breeds. City Guides show pet-friendly hotels, attractions, such as tours, stores & historical sites, campgrounds and parks,& off-leash parks, beaches, patio dining, skiing, and more. You can also view free listings, highway guides, the site’s blog, or their dog travel books/ebooks. You can even join their newsletter to find out about everything dog-friendly!